I wish to thank you for the humbling experience of representing you as Grand Superintendent and express my pledge to assist you in any way that I am able during my term in office and I thank R. Ex. Comp. Peter Rhodes for successfully guiding District 10 during his term in office. Congratulations are also extended to V. Ex. Comp. John Mitchell on his appointment at the past Grand Chapter Assembly. The focus of Grand Chapter and my own focus is to continue to do those things that interest other non-Royal Arch Masons to consider this fraternity as a meaningful way to further their masonic knowledge and to do good to others. June 3, 2017 is a day of Masonic open houses during which Craft Masonry together with Capitular and Concordant bodies will highlight, for the public, information which will spark an interest in all aspects of Masonry. 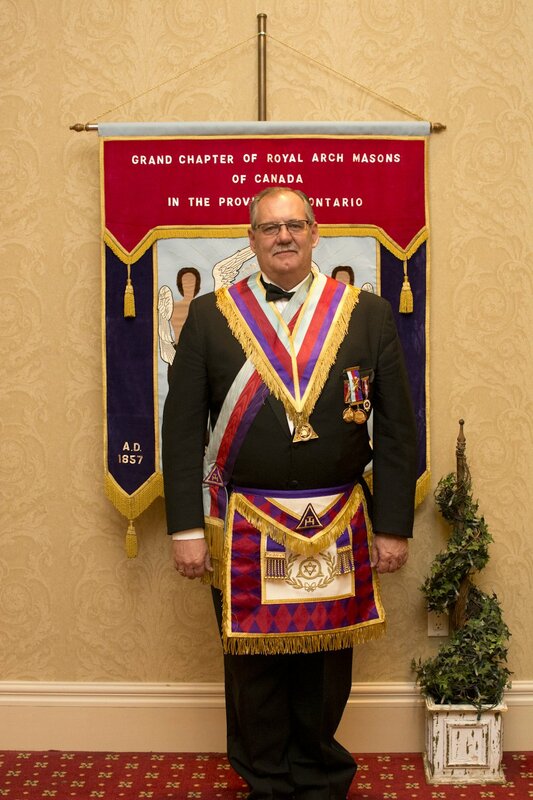 Royal Arch Masons will be available at open house venues in Peterborough, Port Hope, Cobourg and Lindsay to help enlighten those Masons and Non-Masons about our ancient and honourable institution. District 10 has and will continue to build relationships with our craft lodges through social functions that are inclusive of family, friends and masons of all bodies. This thrust includes BBQs, Devine Service, Ladies and friends events and any other social event to expose Royal Arch Masonry to those with interest. Grand Chapter is encouraging Chapters to focus on those members who seem to be lost and encourage them to attend Chapter once again. Most Craft Lodges have developed a Chapter representative in their respective Lodges and are utilizing space in their summons to promote Royal Arch Masonry and I encourage each of us to use these media to promote York Rite Masonry. One significant event is being planned at this moment and that is the 150th year Anniversary celebration of Pentalpha Chapter No. 28. This will take place on Saturday, November 18, 2017 and tickets are available. I note also that Corinthian Chapter No. 36 and Victoria Chapter No. 37 are beginning to plan for the same event which takes place in 2019. Ex. Comp. Peter La Brash and I would like to be kept informed about other initiatives that are planned within each Chapter such that we may be of assistance if required. Again, thank you companions for your support and continuing commitment to District 10.